Chemlnstruments' extensive line of adhesive testing machines performs a variety of tests such as adhesion, coefficient of friction, release, tansile strenqth, shear strength and tack, as well as many additional parameters. 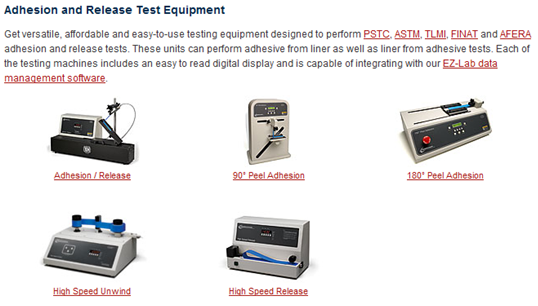 Chemlnstruments provides standard and custom adhesive testing equipment to meet your individual needs for testing pressure sensitive tape. coating and sealants. 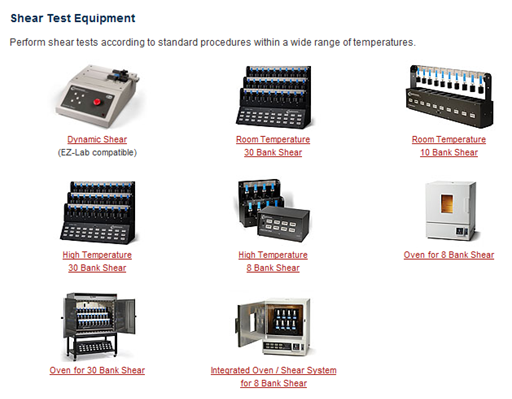 Choose from a comprehensive Line of standard equipment or we can design unique testing equipment specifically for your company's needs. Use powerful statistical analysis and other data review tools to analyze results from your testing and archive this information directly on your computer or network. Choose our user-friendly EZ-Lab data management software and testing equipment to create a complete in-house adhesive testing lab. Produce graphs, use statistical analysis and apply reporting options for presenting test and data results so you can guarantee your adhesive's performance in the maketplace. Cheminstruments in your one-stop. full-service consultant for adhesive testing machines and data management laboratory software. Contact us today.